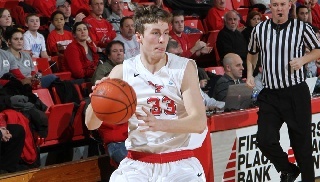 The Youngstown State men's basketball team held on for a 68-67 win over Wright State on Saturday night at the Beeghly. The Raiders missed a would-be game-winning tipin just before the buzzer and that proved to be the difference. The Penguins had a four-point advantage in the final 11 seconds, but Wright State's Matt Vest knocked down a 3-pointer from the corner with 10.7 ticks left. After the first YSU pass was deflected out of bounds, the Raiders stole the next pass and called timeout with 5.8 seconds left. On the ensuing play, DJ Cole deflected a driving attempt, but the ball found a wide-open JT Yoho under the basket. Yoho's attempt at a game winner as time expired rimmed out and the Guins held on for the big win. The win improves the Penguins to 13-9 overall and 4-3 in the Horizon League. Wright State falls to 13-10 and 5-3 in the league. YSU led the first 24:43 of the contest before WSU took it's initial lead of the contest. The Raiders led for 1:13 the entire contest and still almost had a chance to win in the end. The second to last tie of the night came at 43-all following a pair of AJ Pacher free throws. Ryan Weber canned a 3-pointer with 11 minutes left to put the Guins ahead 46-43. YSU held the lead for 10-plus minutes when a three-point play by Pacher tied the game at 62. Cole followed with a baseline-driving layup with 1:27 left and then went off glass from in close again to make the contest 66-62 with 37.7 seconds remaining. With 29.3 seconds left, Chrishawn Hopkins made a pair of free throws to cut the deficit in half. Weber converted two free throws with 19 seconds left to increase the advantage to 68-64 and set up the final frantic seconds. Kendrick Perry and Weber each finished with 18 points while YSU shot 50 percent (23-of-46). Kamren Belin contributed 15 for the Penguins. The Guins charged out of the game scoring the first eight points of the contest. WSU failed to score for the first 7:40 of the game before Tavares Sledge ended the drought. YSU kept the heat on and led 15-5 following a Belin 3-pointer. Wright State trimmed the deficit to 20-14, but a quick 7-2 run by the Guins pushed their advantage out to 27-16, its biggest lead of the night with 4:44 left in the opening half. Wright State pulled within four points twice in the final minute of the half before the Guins took a 33-27 lead at the break. In the first half, the Penguins shot 50 percent making 12-of-24 shots while Wright State hit a 45.8 percent clip (11-of-24). YSU had 10 assists on 12 buckets. Perry had 10 points while the five starters combined for all 33 YSU points. Belin and Weber each contributed eight in the opening stanza. The Penguins start a three-game road swing on Friday, Jan. 31 when they visit Oakland. Tipoff for the contest at the O-rena is set for 7 p.m.